At Upper Echelon Fitness I work with my associates to provide the highest quality coaching possible. 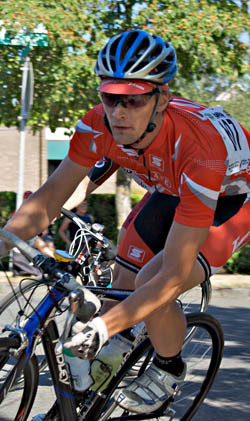 I provide individual training plans to meet individual needs and to help riders meet their cycling and fitness goals. I believe it is important to develop a rider in ways that not only increase their performance on the bike, check but which also translate into a healthier lifestyle. In addition to improving physical and mental fitness, seek I feel many riders can benefit from learning more about their in race decision making as well, more info providing in depth race strategy and tactics however possible. It is my goal to develop riders in all areas, so that a rider may discover their true potential as an athlete. I love watching the people I work with accomplish their goals. I strive to provide the highest quality coaching and to provide as much support as possible for my riders. I am also a Licensed Massage Therapist. I focus on therapeutic deep tissue and structural integration as it pertains to injury recovery, sports performance and general health improvement through body work. I love being able to make a difference in peoples lives for the better! Working with my clients to recover from injuries, removing daily aches and pains and improving their health and comfort in their lives is one of most fulfilling aspects of my career and life! In addition to individual coaching plans and massage therapy, I instruct several Classes at Upper Echelon through the year, ranging from indoor cross training, trainer classes, and skills classes. In the summers, I do a race and bike handling skills course on Monday nights before the Monday night PIR race begins. Fall, winters and early spring I typically hold indoor/outdoor training sessions which complement a riders training goals if they are looking to gain speed in the summer for racing or nice weather group rides and fun rides. I am also available for presentations for teams or groups covering topics such as race tactics, training methods and plan design, bike fitting basics or goal setting around athletic performance. one of the most effective available is massage therapy. I first discovered this as I was starting to really train and race on a national level. With logging of thousands of miles and putting my legs to the test against pelotons full of professional racers, I began to turn to massage as a way to repair my legs and body after the intense training and racing I was putting it through, and found incredible results from the addition of bodywork! This discovery was what had turned me onto the idea of becoming a massage therapist. Today I am happy to say that I am able to pass on the improved recovery and healing aspects to others that have so greatly helped me in the past. But there is still a bit of a science in fine tuning when and where to add massage into your diet if you are an athlete, and the type of body work you receive will depend on your training and racing schedule some what. 1) A pre event tune up massage – this is one that is going to be somewhere between 48hrs to the day off your event. The goal in this session is to generally relax tight muscles, boost blood flow and take away any pre-event nervousness or tension. A couple of days before your big event is not the time for some major deep tissue massage work, extensive myofascial work, or anything else that is likely to have a big lasting effects on you. This is for several reasons – it can take a couple of days for muscles to recover from a bodywork session, in terms of athletic performance, you may experience a decrease in peak performance during this time, just as you would if you did a very hard workout the day before a big event. Deep bodywork is a great tool for a body recovering from injuries and training with athletes, but is best used a little further out from a big event or workout. Make sure your massage is on the lighter side in terms of pressure and be sure that your therapist is aware of your upcoming event. 2) Recovery massage – this is typically done after an event. Massage is a great tool to increase the bodies ability to recover from hard efforts. Many teams and athletes will get massages in between stages of stage races, or after a big event(such as a marathon). The session here should be similar to a pre event massage, with the main goals of the session to improve blood flow to the muscle and also emphasizing on relaxation. It is typically ok to have a little deeper work right after an event than right before, so allowing your therapist to work deeper in this session is encouraged. 3) Deep tissue/focused work/injury recovery – Using a massage to really work out tension and adhesions in muscles from training, and recovering from injuries is a great way to improve performance. The best time jump into more in depth work is after a hard block of training or racing, but during a rest week. If it is not a rest week, be sure you keep fairly relaxed the rest of the day while keeping to an easier workout on the following day, allowing the bodywork to soak in and allow your body to get used to any new improved ranges of motion, body structures, posture or movement patterns. Having more time spent in a superior physical state of being is important in its habit settings-allowing yourself to hold yourself in a better state for more time will more successfully build the long term habit of being in that position. It is also important to let your muscles have some time to recover from the bodywork. You may feel great after the session, but deep and intense work may leave a muscle group in a similar state as it is after a hard workout, so give it a chance to really recover from the session, and your body will thank you generously by maintaining a more comfortable superior state of being and improved athletic performance! Hopefully this helps in determining the timing of your bodywork session if you are actively training and racing. If you have any questions, comments or wish to schedule a therapeutic massage, please contact me! Previous PostWinter training – what to wear to make your training effective!Next PostNew Years Goal setting!